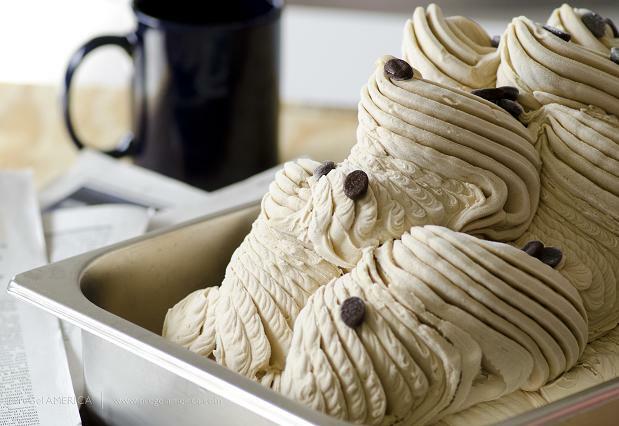 Sirena Gelato specializes in delicious premium gelato, handcrafted one pan at a time in the heart of Bellingham, Washington from an old-fashioned Italian recipe. We utilize a local dairy for our milk, free of growth hormones, as well as seasonal fruit purees. We also make dairy-free flavors! The creaminess of our product comes from density instead of fat. Most ice cream on the market contains upwards of 18% butterfat, but our milk-based gelato flavors contain only 4-8% fat, and our fruit flavors less than 1%. Additionally, our gelato contains less than 20% air content, whereas commercial ice cream may be injected with nearly 100% air. Also, most of our flavors contain less than 0.1 grams of sodium per 100 gram serving and .01-5 grams of protein. Overall, our gelato contains far less fat, calories and sugar than typical American style ice cream. Exact numbers vary by flavor. Below is a nutritional breakdown of some of our more popular flavors based on approximately 100 gram serving. **All of our gelato products are made in a facility that contains milk, dairy, gluten, soy, eggs, fruit, peanuts and other nut varieties. The management advises that we have all of these products on our premises, and that cross-contamination may occur; if you have a sensitive food allergy, please take precaution. Thank you!